But if applied improperly, the ash can be caustic. For gardeners who heat their homes in winter using stoves or fireplaces, good-quality wood ashes can be a soil-amendment bonus. But if applied improperly, they can be a caustic topping for foliage-heavy plants and seedlings. The primary benefits of recycling wood ash into the soil are for fertilizing and raising pH levels to make soil less acidic, said Leonard Perry, horticulture professor emeritus with the University of Vermont. Soil pH acidity is measured on a 14-point scale, with 7 being neutral. Anything below 7 is classified acidic. Anything above that is alkaline. “What this means for soil ashes is that if your soil is 6.5 to 7 or above, don’t add them,” Perry said in a fact sheet. Always test the soil before spreading ashes. Wood ash contains calcium, magnesium, and potassium among a dozen or more important nutrients. “They vary widely with the types of trees being burned,” Gaskin said. Hardwoods, including oak, maple, ash, hickory, sycamore, walnut, apple and cherry, burn hotter and longer. They also produce several times more ash and contain more nutrients than softwoods like pine and fir. Avoid using fireplace or wood ashes from pressure-treated wood, painted wood and cardboard. They carry chemicals that can harm plants. The same goes for charcoal residue from BBQ grills, fake fireplace logs and coal. Those should go to the landfill. 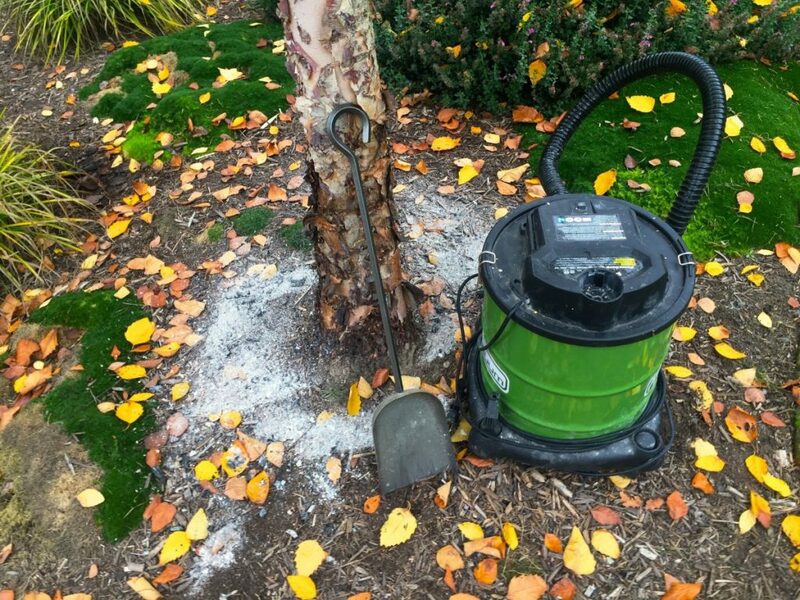 Wood ash can be used sparingly in gardens, spread thinly over lawns and stirred thoroughly into compost piles. Lawns needing lime and potassium benefit from wood ash – 10 to 15 pounds per 1,000 square feet, Perry said. “This is the amount you may get from one cord of firewood,” he said. Avoid applying wood ashes if you’re about to seed your garden, said Alicia Lamborn, a horticulturist with University of Florida Extension. Some people store the ash they remove from their stoves in winter for applications throughout the year. “You don’t want to pile it on in one season or just one time,” Lamborn said. Do not spread ashes around acid-loving plants like blueberries, strawberries, azaleas, rhododendrons, camellias, holly, potatoes or parsley. Plants that thrive with a dressing of wood ash include garlic, chives, leeks, lettuces, asparagus and stone-fruit trees. For more about wood ashes as a natural fertilizer, see this blog from the University of Florida.